5a. What are the important factors controlling ecosystem functioning within the TIDE estuaries? 5b. How do TIDE estuaries function as a filter for nutrients? 5c. How can we avoid oxygen deficiency situations in the TIDE estuaries? 5d. Which variables limit primary production in the TIDE estuaries? Estuaries are the last barrier to the coastal zone and can be considered as a large biogeochemical reactor. With the tide intruding, while freshwater discharging from the rivers upstream, very dynamic environments are created, marked by a strong salinity gradient. Changes in ionic strength, dissolved organic matter content, pH and in the carbonate system between fresh and saltwater end members are induced, resulting in changed speciation of nutrient species and thus, reactivity of the estuarine system. Estuaries always have had a great appeal to humanity. About 40% of the global population lives within 100 km of the shoreline. However, this implies a large demographic and economical pressure upon estuarine ecology (Statham et al. 2011). Land use change and increasing population have caused increased nutrient inputs for total dissolved inorganic nitrogen and phosphate. Increasing efforts for water treatment since the 80ies, have reduced these nutrient inputs again. However, since phosphate is point source related, while nitrogen is rather diffuse source related, phosphate loads have been controlled more efficiently and nutrient ratios within the estuary and nutrient ratios of loads arriving in the coastal zone have changed disproportionally, changing phytoplankton communities and overall ecological functioning (Statham et al. 2011). This has often been associated with negative effects, such as nuisance algal blooms (e.g. Phaeocystis; Rousseaux et al. 2002), immediately fuelling the microbial loop instead of transferring energy to the higher, often economically valuable, trophic levels and promoting oxygen deficiencies (Rousseaux et al. 2006, Carbonnel et al. 2009). Within the TIDE report main focus will be on water quality patterns and sink-source functions for oxygen and macronutrients and primary production in the water column. Data for intertidal exchange were not available. Nevertheless, importance of the intertidal is discussed when ought to be an important explanatory variable in the research question to be addressed. Riverine inputs are recognized as the world’s major source of macronutrients to the global oceans. 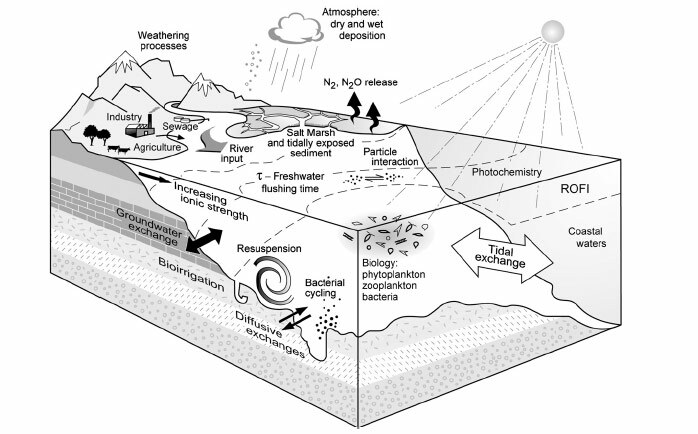 However, macronutrients passing through estuaries are subjected to several biogeochemical transformations, both in the water column and by exchange with the sediment of the subtidal and intertidal area. Furthermore, there may be additional atmospheric or coastal inputs and overall strong physical control by hydro-morphology (residence time, light climate, suspended matter dynamics, freshwater discharge…) (Desmit et al. 2005, Statham et al. 2011). Groundwater input might be another, at present underestimated, source of input (Statham et al. 2011). Overall interactions within estuaries and the environment are presented in fig. 1. Fig. 1 Estuarine processes and exchanges for nitrogen, phosphorus and dissolved silica according to Statham et al. 2011 (ROFI = Region of Freshwater Influence). Most northern temperate estuaries are net heterotrophic experiencing more respiration than production (van der Zee et al. 2007). In the following subsections some general background information per TIDE estuary is given. All estuaries share similar challenges for economy (all TIDE estuaries have at least one port) and ecology (protection of several Special Protected Areas along their estuarine gradient according to the European Habitat and Bird Directives). The Elbe estuary stretches from the tidal weir at Geesthacht up to mouth in the North Sea, beyond Cuxhaven (171 TIDE km). The Elbe river catchment is about 148 268 km² large. An average freshwater discharge of 730 m³/s is observed (Schlarbaum et al. 2010). The main tributaries flow into the upstream riverine part of the Elbe river (Quiel et al. 2011). The freshwater discharge from upstream entering the estuary is so large; that further input of tributaries within the estuary was considered of minor importance in TIDE. The Elbe is considered the largest source for total dissolved inorganic nitrogen and phosphate to the German Bight, a region often experiencing extensive Phaeocystis blooms. A large part of the Elbe is continuously dredged and most is channelled, to ensure navigability of large container ships up to Hamburg, one of the world’s largest ports (Schlarbaum et al. 2010). The Elbe is recently (spring 1999) been further deepened about 1 m in the freshwater zone, near the Hamburg port area. An increase in tidal range, currently 4 m at spring tide, has placed the estuary at the border of a meso- and macro-tidal estuary (Kerner 2007). However, the Elbe was classified as partially mixed based on its salinity profiles. According to literature residence times varies from 10 days in winter, up to 72 days in summer. The salinity front is observed near Glückstadter, coinciding with the estuarine turbidity maximum zone (TIDE km 84 -114) (Schlarbaum et al. 2010). There are about 170 inhabitants per square kilometre. Agricultural land use dominates the catchment (Quiel et al. 2011 and refs herein). The water quality has improved since the 80ies, with phosphorus being banned from detergents in 1987. In the beginning of the 90ies a tremendous change concerning the load of the Elbe river has happened due to the breakdown of important industrial companies of the formerly German Democratic Republic. Improvements in wastewater treatment plants and in industrial inputs strongly influenced the water quality of the Elbe river and its estuary. Loads for nitrogen and phosphorus decreased significantly, but disproportional, leading to increased nitrogen phosphorus ratios (Schlarbaum et al. 2010). The Scheldt estuary reaches from the tidal weir in Gent (Belgium) to the mouth in the North Sea at Vlissingen (the Netherlands) (160 TIDE km). The Scheldt river catchment is about 21 580 km³ large. The Scheldt estuary comprises two main tributaries, the Rupel and the Dender. Taking discharges into account, the Rupel can be considered the most important tributary. Freshwater coming from the upstream boundary, the Bovenschelde, is in part deflected to canals (e.g. Gent-Terneuzen). Within the Rupel, also inputs from sub-tributaries the Zenne, Dijle and Nete are gathered. The catchment is mostly urban, comprising about 400 inhabitants per square kilometre, and also experiences intense industrial activity near the port of Antwerp, Gent and Vlissingen (Arndt et al. 2011, van der Zee et al. 2007). Water quality decreased with increasing population, but has improved considerably since the 90ies due to enhanced water treatment effort. Since 1996 the water treatment of household effluents changed, significantly reducing phosphorus loads (Van Damme et al. 2005, Soetaert et al. 2006). However, it was not until 2007, water from the Zenne, entering the Scheldt estuary via the Rupel, was treated (corresponding to 1 million inhabitants) (Aquiris 2010). The average channel depth is about 15 to 20 m. The estuary can be classified as a well-mixed, macro-tidal estuary. The dominant tidal influences, cause residence times of 50 to 70 days in the Westerschelde (Soetaert et al. 1995). The Scheldt is relatively turbid, with maximum values of 400 mg/l suspended particulate matter. The salinity intrusion is observed near the Rupel mouth (salinities usually lower than one). Most intense algal blooms are observed in summer in the upper reaches of the freshwater part of the estuary (Arndt et al. 2011). The Humber is the largest river catchment of England, covering about 20 % of its surface area (24 240 km²). Also in terms of freshwater flow, the Humber estuary is largest in the UK (250 m³/s) (Sanders et al. 1997). It can be classified as a large well-mixed, macro-tidal estuary. Tidal range goes up to 6 m. Turbidity can increase up to 3000 mg/l near Brough and effectively inhibits any primary production in the water column. However, a phytoplankton bloom can be observed in the estuarine plume around Spurn point (Jickels et al. 2000). Despite high suspended matter concentrations, only 0.1∙106 ton is carried to the sea. Most sediment is imported from the sea into the estuary. Most is coming from the erosion of the Holderness cliffs near Spurn Point (Mortimer et al. 1998). The estuary is fed by two main tidal freshwater rivers, the Ouse and Trent. The river catchment encompasses a mix of industrialized areas, agriculture and urban area. The estuarine turbidity maximum can be found in the lower salinity reaches. Both the salinity intrusion front and the turbidity maximum zone shift seasonally up- and downstream by differences in discharge. However, the fresh-saltwater interface is more susceptible for differences in seasonal discharge (Uncles et al. 2001, Uncles et al. 2006). The estuarine turbidity maximum zone is located 20 to 50 km downstream the tidal weir at Naburn. The TIDE estuary boundaries are set at the tidal limit of the Ouse, flowing to the Humber, and finally to Spurn point (TIDE km 122). The Trent is, like the Rupel for the Scheldt estuary, considered, as the most important tributary for the Humber. The origin of the suspended particulate matter is essentially mineral and falls within the clay size class. Residence times for suspended particulate matter have been calculated as large as 18 years, due to non-conservative mixing (repeatedly settling and re-suspension) (Statham et al. 2011). Residence time for dissolved substances increases up to 2 months in summer, less in winter (Jickels et al. 2000). The Weser estuary reaches from the tidal weir in South Bremen up to the mouth in the North Sea (119 TIDE km). The river catchment is 46 000 km2 large. The tidal range is about 4 m at Bremen, and 3.6 m at Bremerhaven, implying the Weser estuary, like the Elbe estuary, is placed at the border between a meso-tidal and a macro-tidal estuary. The Weser is considered a well-mixed estuary. The bottom sediments are fine-grained except for the area between 53 and 66 TIDE km, where muddy sediments dominate. Due to salt mining in the catchment, the freshwater part of the estuary can reach values up to 2 PSU, depending on the freshwater run-off (Grabemann & Krause 2001, Villars & Delvigne 2001). Residence time varies from 2 to 20 days depending on freshwater discharge. Only limited research has been performed upon water quality and nutrient fluxes in the Weser estuary (Grabemann et al. 1990, Schuchardt et al. 1993). 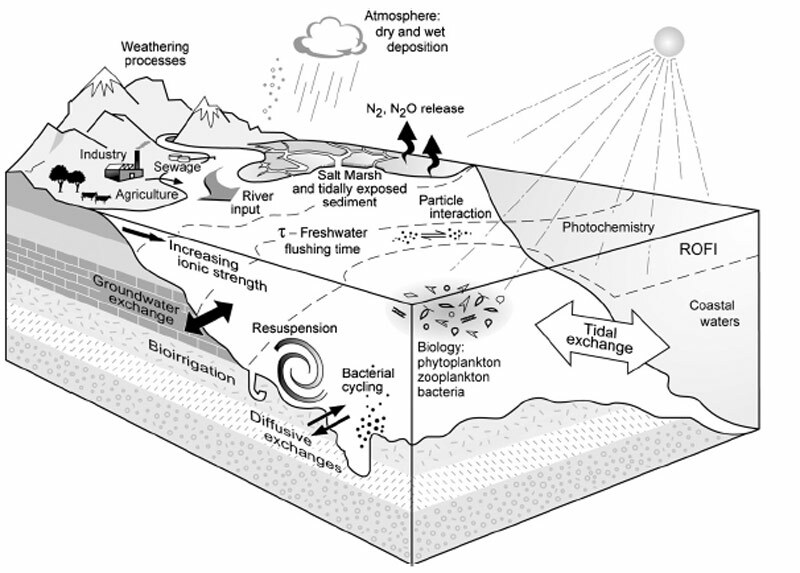 Most studies focus upon the estuarine turbidity zone and sediment dynamics in general (e.g. Müller et al. 1990, Grabemann & Krause 2001). Suspended matter concentration can reach up to 1500 mg/l (Villars & Delvigne 2001). The estuarine turbidity maximum zone is found in the low salinity reaches (TIDE km 60 to 70) of the Weser estuary and its formation can be associated with tidal asymmetry effects. The exact position depends highly on freshwater discharge (Grabemann & Krause 2001 and refs herein). Much of the land use around the Weser is for agriculture and livestock. Like for the Elbe, also in the Weser nitrogen and phosphate from river inputs have reduced significantly. Nitrogen reduced since the 80ies, and phosphate since the 90ies. Also in the Weser estuary this has lead to disproportional nutrient ratios. Even though both nitrogen and phosphorus inputs markedly decreased, the river input to the Weser estuary can still be considered net positive for both nitrogen and phosphorus (RBC Weser 2009). How can we avoid oxygen deficiency situations? How do TIDE estuaries function as a filter for nutrients? What are the important factors controlling ecosystem functioning? Which variables limit estuarine primary production?